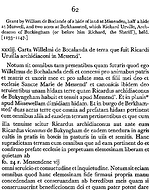 Cartulary: Hereford 1079-1234. J. Barrow. English Episcopal Acta Volume 7. British Academy, Oxford University Press. Oxford. 1993.